The TrekDesk Treadmill Desk is an innovative new fitness product geared toward multitasking individuals who want to bring their work to their workout. This work desk is designed to wrap around the front of a treadmill, allowing a person to walk at about 2 mph while reading, writing, or using a computer. The TrekDesk appeared on the market in 2008 while the treadmill desk trend was just beginning to take off, and it’s only grown in popularity as more and more people become aware of the health risks of a sedentary lifestyle. It has a powder-coated steel base and a scratch-resistant gray top, also steel reinforced. Wide arms extend around the sides of the tread portion of the treadmill, keeping everything within easy reach. Support struts add extra stability, and the edges are beveled for comfort. The height setting is manually adjustable, and offers proper ergonomic support to anyone between the heights of 5’4″ and 6’4″. If needed, the desk folds up, allowing for easy transportation. Amazon has the TrekDesk listed at $479. It’s no secret that walking promotes cardiac health, but research shows it can also reduce stress and even boost cognitive ability – useful qualities for an office desk. Thousands of people have already taken advantage of the health benefits by adding a treadmill to their home, and in recent years, companies have released many versions of treadmills with desks attached. The TrekDesk is different from most in that the desk is sold alone, meaning there’s no need to replace your old treadmill. It can be used with whatever model you already own, or you can shop around to find one that meets your specific needs and price range. Putting together the TrekDesk is not a difficult task, though it does require the use of a power drill. Assembly time is generally no more than an hour. Unlike some other treadmill desk models, the TrekDesk can be moved into place without having to disassemble the vertical section of the treadmill itself. The desk simply fits in between the treadmill display screen and the walking tread. Because the desk is also collapsible, it can be moved and stored with far more ease than an ordinary desk. Making the TrekDesk even more appealing is the sheer number of accessories it offers, in addition to a vast workspace. Even considering the file tray, cup holders, phone holder, and manuscript holder, the desk still provides plenty of room for a computer monitor, keyboard, printer, and any books or files you choose to keep there. Each accessory fits into a slot, and the slots are interchangeable, letting you arrange the desktop however you want. Organization is simple, so you won’t need to worry about clutter. Since the TrekDesk offers such a large workspace, it may be difficult to fit into an already cramped office or home gym. It will also shorten tread length, so it may not leave a user with much walking room if used with a treadmill that already has a short tread. At 57 lbs, the desk is not too heavy, though even in its collapsed state, some individuals may find it cumbersome. One notable flaw is that, when walking at faster speeds, the desk has a slight tendency to sway, which can make activities like writing or precise mouse-clicking difficult. More often than not, this swaying can be fixed by simply tightening the end caps, or adjusting it to a lower height. A higher end brand, Lifespan, offers several sleek desk models with treadmills included, but the desk is smaller in size, and the prices often run into the thousands. Of course, a large part of the cost difference is that you are required to buy an entire new treadmill along with the desk. 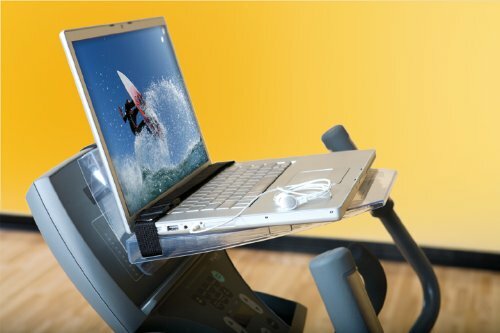 At $667, the Exerpeutic 2000 treadmill desk is another popular model with treadmill included. While the price is certainly competitive, you do, as they say, get what you pay for. The desk is cramped, and far less versatile. It also lacks height adjustments, making it hit-or-miss on whether you’ll be risking back injury as you strain to reach your work materials. For a happy medium between quality and cost, the TrekDesk is the ideal fit for someone who has a treadmill in mind and is only looking for a well-functioning desk to add on. If desired, it can even be used on its own as a regular standing desk, which is still a better ergonomic choice than a traditional desk. An added bonus is the company’s excellent customer service. They are easily accessible, and are glad to replace any missing or broken pieces. Returns are easy and prompt, refunds are issued in full, and the product has a two-year warranty. The TrekDesk is a simple design, not the cutting edge in stylish home or office decor, but it is fantastically multi-functional, durable, and reasonably priced. Overall, the TrekDesk is a worthwhile addition to any home or office.